A few weeks ago I realized that I am a runner. I finally feel I can truly call myself a runner because when I missed a run in my schedule, the first time in weeks, it felt weird. I felt off the entire day. I used to feel like that with writing. I still do in some respects, but not in that down to the core way. 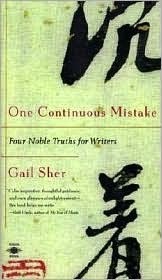 To help, I picked up my copy of One Continuous Mistake by Gail Sher. I've had it for quite a while - 15 years. I know this because my sister inscribed it when she gave it to be way back in 1999. I've read it before, or at least some of it, and it's been sitting on my bedside table for several months now. Finally today I started to re-read it. And, as with so many things, I have these moments of inspiration where I feel like I need to do everything at once. But of course I can't. Like right now, I have three different blog posts in draft form because I have all these ideas. Which is great - and weird. Normally I feel like I have no ideas for blog posts. But that is part of the process. Getting into a habit of putting things down, even if it's just in a draft form, and working on it. Not making it something that has to be done today, right now, all or nothing. That all or nothing part is where I get stuck. It's overwhelming and I end up doing nothing. But if you do just a little bit, it adds up. The book talks about kaizen - a Japanese concept that little steps, gradual progression leads to improvement. I also have an article hanging on my wall at work that references kaizen. I look at it to remind myself of the little steps I need to take. And really that's all it is; just little steps. My transformation from a runner to a Runner was little steps (literally). I just kept at it. I gave myself goals and broke them down into plans (actually Hal Higdon did) and then I did them. No one goes from non runner to doing a marathon in a week or a month. But if you've put in all those little steps for weeks, and months, and years before hand, you can - I did. Today, I have put ideas into draft form for several blog posts. This is my little step. I have also read something specific to writing. This is my little step. And tomorrow, I make a vow to work on one of the blog posts even if it's just for 10 minutes, and do that every day until the habit becomes something that defines me. That leaves an empty space if I don't do it. So when I call myself a writer, which I do, I don't feel like I'm fudging, which I do, because even if I'm not "published" or being read by anyone, I am still a writer.